I'm mulling over options for an outbuilding. Something about the size of a 4-car garage, so either a large garage or small barn. Ideally I'd like to do much of the building work myself but I'm also aware that it needs to be done properly. I'm not overly keen on a plain metal building or an OTT grand timber framed number but I had thought about a steel frame, which could be professionally installed, and then the cladding, doors, windows etc could be added by myself. Has anyone heard of such a thing? A few examples show up in the US but not much here. Any other options? You could extend the way that our shed's built more or less indefinitely I'd have thought. There's a concrete slab which was here already, uprights go into metal shoes bolted to that. Onduline roofing. That`s not a bad job at all,well done. You looked on ebay ? "steel framed building"
Also a few used ones, mostly (I'm guessing) too high for permitted development ? Do you have more than 12 acres, Treac? If so, pretty much, the worlds your oyster. how windy is it ? will it need a slab floor ? is the site level or will it need serious ground works? based on the principle that "stuff" expands to fill the available space is it worth going for the bigger end of the size you think you need ? how much does look outweigh costs?the look of a "industrial"style building can be rapidly improved with paint and /or fast growing plants. self build is best done using materials and methods you are comfortable with. there was talk of firms building a free barn in exchange for using the roof for pv panels ,iirc it needs to be near 3 phase mains and might have depended on the good feed in tariffs but it might be worth considering. It might be worth asking around, especially if there are any working farms that have recently been sold off to domestic markets as quite often people will want useful buildings moving and they're often happy to give them away if you're prepared to take them. That's how we've got all of our buildings for the farm. I've not seen any suitable 2nd hand buildings and I'm not worried about planning issues. I didn't think of ebay, thanks OMB. I was hoping there would someone selling a steel framed building designed to be clad with timber, something I could get an idea of what to do and prices. Another option might be a smaller metal garage and I could make my own timber framed workshop. Surely there must be a steel fabricator in your area who can give you a quote on the size building you need in kit form. The quotes for my shed from a steel fabricator were around double the cost of building it myself in timber. My 12 x 5m shed (above) cost just over 2K including the groundwork. All steel frames now have to have a CE mark I believe so the fabricator has to be able to do this. 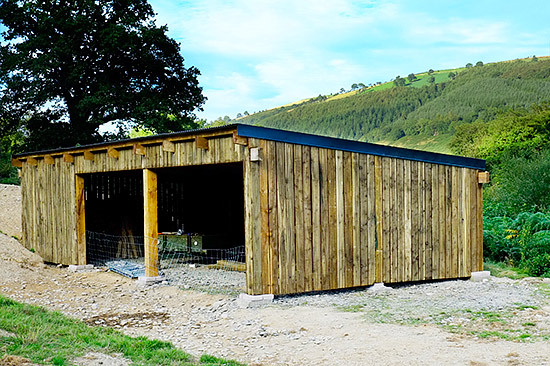 I don't know where you are based, but one of my customers makes and another erects steel framed buildings, They are based in West Shropshire. They don't worry how far they have to go, but you would have to have the base area ready. The erector is currently in S. Devon putting one up. But there will be such folks available wherever you are anyway, and they will do as much or as little as you want-just the frame, or frame and roof, or the whole job footings included. I don't have the knowledge to ask a local company to fabricate me a frame. There's plenty of companies that make off the peg frames and buildings and a few local ones I'll go an see if I go the whole building route. I'm just trying to understand what options there are and hopefully get an idea of prices. On that note, thanks Rob, that's the sort of thing I was after. To be honest,what knowledge do you need? Other than to ask,How much to fabricate a shed so and so size.